Are you looking for a treaty or other international agreement? A non-U.S. law? A foreign court decision in English translation? Comparative commentary on an area of law? A European Union directive? A UN resolution? Here are a few sources you can start with for various types of foreign, comparative, and international law (FCIL) research questions. And especially here in Chicago. Several of the 80+ FCIL librarian specialists in the U.S. call Chicago home or are CALL members: me (Lyonette Louis-Jacques), Anne Abramson, Julienne Grant, and Trezlen Drake. Bill Schwesig is the Anglo-American/Common Law Bibliographer at D’Angelo Law Library. Jean Wenger and Heidi Kuehl, now in administrative positions, also have FCIL research expertise. You can ask us for help with research strategies and resources when you’re stuck. You can also check our library catalogs and websites. In terms of FCIL collection strengths and specialties, the University of Chicago and Northwestern Pritzker are strong for international law and West European law. Chicago-Kent houses international documents from the defunct Library of International Relations (LIR). John Marshall has a special Chinese intellectual property collection. Loyola has great Latin American law LibGuides. Cook County Law Library has practice-oriented foreign law resources. Besides consulting locally, you can also ask for help on the INT-LAW and IALLmembers listservs – FCIL librarians from all over the world are on those public, open lists. The AALL FCIL-SIS also has a members-only eCommunity and an open Jumpstart guide to experts on particular countries or international law topics with whom you can consult. Before you ask for help, though, you should do a little digging on your own first. If you have a foreign law question, you can start with a legal research guide. 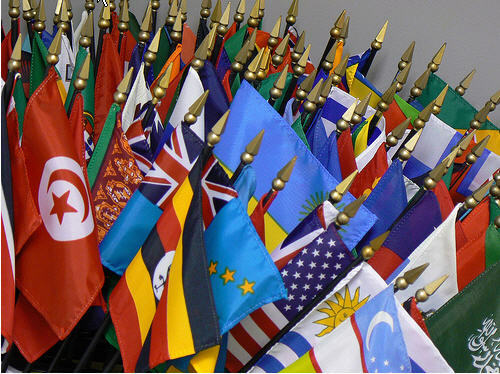 NYU’s GlobaLex site has free guides on researching the law of over 100 countries as well as guides on special areas of comparative and international law. Check out Mary Rumsey’s Basic Guide to Researching Foreign Law for sure. Another free resource is the Law Library of Congress’ Guide to Law Online. The Foreign Law Guide subscription database is also a handy tool. For international law, you can also check the free ASIL Electronic Resource Guide for International Law (ERG). For treaties, statutes, national and international court cases, and other foreign and international primary law, the World Legal Information Institute (WorldLII) and other LIIs or Free Access to Law Movement (FALM) sites are great to check. There are over 50 of them. And you can also go directly to the websites of inter-governmental organizations (IGOs), non-governmental organization (NGOs), government agencies, and courts to locate their publications and documents. The UN’s Official Document System (ODS) is one of my favorite sources to use. Another free UN resource is the Audiovisual Library for International Law (AVL). If your library subscribes to HeinOnline, you may have access to all types of international law sources if the Foreign & International Law Resources Database (FILRD) module is included. It’s great for treaties, international court decisions, journal articles, and yearbooks. CALL libraries provide access to over 100 foreign, comparative and international law databases and other online resources that complement the free FCIL-related websites and people resources like wonderful FCIL librarians. You can consult a list of FCIL databases available in CALL libraries here. To locate what libraries own FCIL-related books, besides local library catalogs, you can also check Open WorldCat, the Karlsruhe Virtual Catalog (KVK), Google Books, and HathiTrust. For FCIL-related articles, besides the usual suspects, you can check Google Scholar, SSRN, and the bepress Digital Law/Law Review Commons. As with all types of research, a general Google web search, Wikipedia, or doing a full text search in a journal or book database will help you locate more information about, citations to, or the full texts of FCIL materials of all types. Westlaw’s journals database is one of my favorite tools for finding citations to FCIL sources. If you need to decipher a citation, the Cardiff Index to Legal Abbreviations is available for you to search for free. And the Bluebook lists abbreviations for many foreign and international law sources. Foreign, comparative, and international legal research can be challenging but often very fun. Nothing beats happy users. Hope this guide gives you a good headstart in helping users locate the FCIL resources they need!